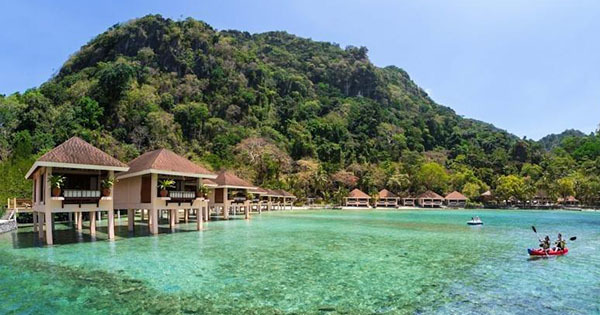 El Nido in Palawan is one of the most sought-after destinations in the world. And when visiting this unspoiled paradise, there is no other place to stay at aside from El Nido Resorts. With four islands to choose from, this resort that advocates sustainable tourism promises a beautiful and worthwhile vacation experience like no other. #1 - Breathtaking Scenery: There is no question, Palawan is a paradise on earth; El Nido Resorts specifically highlighted that fact. Each of the four resorts has equally beautiful settings: Apulit Island with a 60-meter limestone cliff, great diving spots, and caves; Miniloc Island with a native and rustic feel and is also a gateway to Bacuit Bay, Big and Small Lagoons, and Snake Island; Lagen Island surrounded by lush green islands with a rich biodiversity; and Pangulasian Island, a luxurious island resort fronting a pristine beach with a forest backdrop. #2 - Sustainable Tourism: Any place or thing, no matter how beautiful, when exploited in any way, could still lose its beauty. El Nido Resorts believe in this motto as they are committed to providing leisurely experiences and services in a way that it has the least impact on the environment through programs such as waste management, nature conservation, and many more. Through these efforts, El Nido Resorts has maintained its beautiful and natural touch up to this day. #3 - Delightful Activities: With the beautiful sightings come great adventures, too! Adventure-seekers mostly enjoy the eco-adventure resort, Apulit Island, where they can rappel off the 60-meter limestone cliff and explore the caves in the area. Pangulasian Island, on the other hand, offers pampering activities through their spa treatments. Other activities such as canoeing, paddle boarding, windsurfing, snorkeling, diving, island hopping, etc. are also available at each resort. #4 - Comfortable Accommodations: What makes it even more delighting after a day of adventure is a comfy relaxation. Each of the four island resort has different accommodation themes, all exuding a luxurious contemporary Filipino architecture with privacy and exclusivity. Each room, may it be a cottage, suite, or villa, is built strategically to fit every guests' needs and more. #5 - Superb Service: To top it all up is the pampering service of the staff in El Nido Resorts. Feel like kings and queens with the genuine local hospitality while feeling at home at the same time. The staff's friendly smiles and greetings would definitely want to make you stay for more days!